Esposito » Roger Perron Inc.
We first worked with Roger Perron about 10 years ago and found the entire experience to be a positive one. 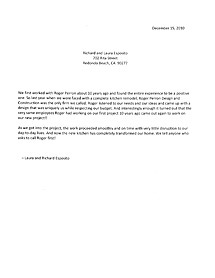 So last year when we were faced with a complete kitchen remodel, Roger Perron Design and Construction was the only firm we called. Roger listened to our needs and our ideas and came up with a design that was uniquely us while respecting our budget. And interestingly enough it turned out that the very same employees Roger had working on our first project 10 years ago came out again to work on our new project!! As we got into the project, the work proceeded smoothly and on time with very little disruption to our day-to-day lives. And now the new kitchen has completely transformed our home. We tell anyone who asks to call Roger first!